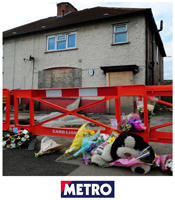 On 11th May 2012, Jade, John, Jack, Jesse and Jayden Philpott were killed in a house fire at 18 Victory Road, Allenton, Derby. Their half-brother Duwayne Philpott died in hospital three days later – all children were aged between 5 and 13. The fire was started by their father, Mick Philpott and his accomplice Paul Mosley in an attempt to frame his ex-girlfriend Lisa Willis who had recently left him, and to gain custody of their children. It went tragically wrong but not before Mick Philpott and his wife Mairead on 16th May held an emotional news conference describing the events of that day – one of the investigating officers went on record after they were convicted stating that when he was caught by a television camera staring at the grieving Mick Philpott it was because he suspected his involvement in the fire. Mick Philpott and his wife Mairead Philpott were arrested on 28th May 2012, just 12 days after the news conference and charged with murder on 30th May and held on remand. On 5th November 2012 Mick Philpott’s accomplice, Paul Mosley was also charged with the same offence but later the offence of all three (murder) was downgraded to manslaughter as it was decided they (the Philpott’s and Mosley) had not intended to kill the children. While on remand at the time for the murder, the funerals of the children took place on 22nd June which the Philpott’s were prevented from attending and by 12th February 2013 their trial had started at Nottingham Crown Court. On April 4th Mick Phipott was convicted of manslaughter and sentenced to life imprisonment with a tariff that he serve a minimum of 15 years, his wife and Mosley were sentenced to 17 years of which they will serve at least half before their release on licence.